This little Boston Terrier is laying in her very own dog house. The entire top of the piece is hand-sculpted with polymer clay. The dog house is white with pink heart and flower accents on all walls. There are little flowers blooming around the house on colored wire. 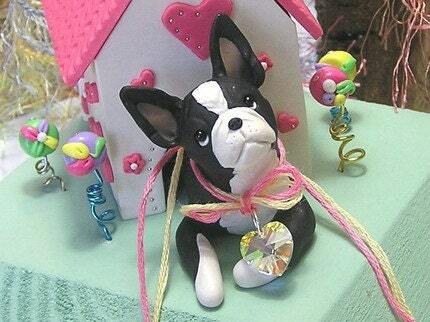 The house and flowers are fused to the base, but the Boston Terrier herself is removable and can lay either in the house or be taken out to be placed elsewhere. She wears a 10mm Swarovski crystal AB heart around her neck attached with pink and yellow embroidery threads. The entire piece sits on a pale green wooden hand-cut and painted base.